Soft Touch Dentistry is pleased to offer tooth colored dental fillings as well as complete family dental care for the residents of O'Fallon, St. Louis and the surrounding areas. Our practice is led by an experienced and caring dentist, Dr. Sarah Thompson, who is passionate about helping patients achieve a healthy and beautiful smile through all stages of life. You will find that our modern dental practice makes your comfort our priority. We offer relaxing amenities, chair side patient education videos and both oral and IV sedation dentistry to keep you at ease during your appointment. When it comes to restoring your smile with a dental filling, Dr. Thompson is equipped to handle your needs with skilled precision and the most personalized patient care. 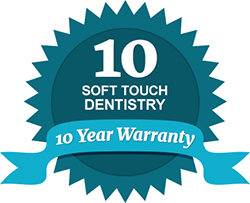 Soft Touch Dentistry provides natural color dental fillings as a restorative procedure that gives ideal aesthetic results. A dental filling can be used to repair a tooth that is decayed, cracked or fractured. We use high quality composite fillings that match your natural tooth color, making it an ideal solution for front teeth that are more visible. The process involves removing the decayed portion of a tooth, cleaning and sealing the tooth and then filling the void with durable white filling material. You can trust that Dr. Thompson carries the restorative expertise you need and the cosmetic dentistry talent you deserve to give you the most natural and long-lasting dental filling possible. Our dental team is committed to a personalized approach with each patient, delivering state-of-the-art dental care in a caring, stress-free environment. Whether you are in need of routine preventative care, a complex restorative procedure or you want to enhance your smile with one of our cosmetic dental services, we can help you at Soft Touch Dentistry. If you are looking for a dentist who can restore both form and function to your smile with a tooth colored filling, contact our office. We are a family dental practice that accepts most dental insurance providers and we offer flexible financing plans to help your family receive the dental care you need. We invite you to discover the difference at Soft Touch Dentistry, where we consider it a privilege to care for you smile.